Page load time can make or break a website. A site that takes ages to load drives its visitors off, not knowingly but unknowingly. You might use social media or other resources to push up conversion, but all efforts will end in vain if the load time isn’t up to the snuff. Users love websites that load fast despite being laden with images and videos. Is it possible to offer users a fast browsing experience? Yes, it’s possible. There are tips for reducing the page load time. 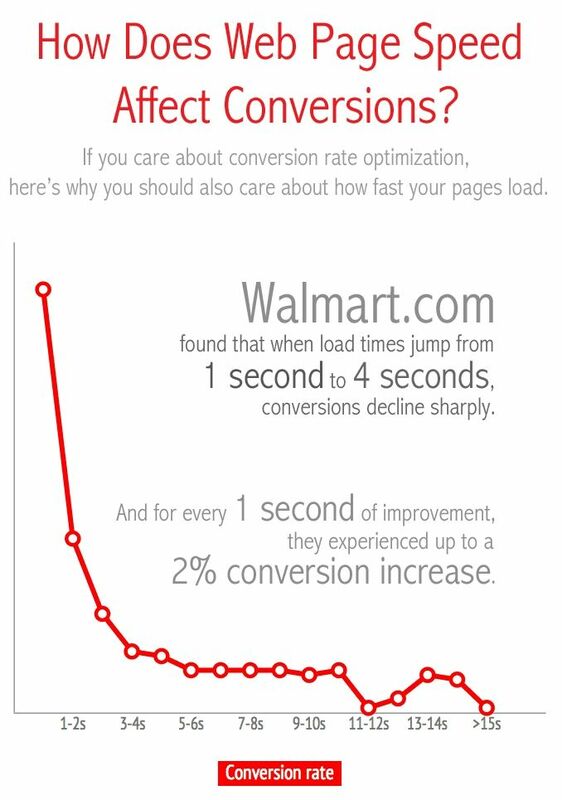 But before we discuss them, let’s have a full grasp of how page load time impacts conversion rate. After all, all the online activities are aimed at only one goal – conversion. I don’t want to start with speculations. We’ll have ample time to speculate later. I’d like to start with some facts and stat figures that shed light on the interconnectedness between load time and traffic conversion. #Fact 1: For a normal website, a delay of just one second can result in a 7% drop in conversion rate. #Fact 2: For an e-commerce website that makes $3 million a month from sales, a 1-second delay translates to the loss of a staggering $2.5 million over a year. #Fact 3: A company of Amazon’s stature could lose $1.6 billion in sales revenue over a year if there’s a delay of only one second. The facts stated above validate the age-old aphorism that says every second counts in business. Loading time makes a big time impact on conversion rate and ensuing sale. Business sites are more at a risk compared to non-business sites. Sites that are primarily content based (blogging or how-to types) don’t lose business if a page loads slow. Those sites lose visitors, but a business site loses money. Now you might say the two are same as blogging sites cash out on visitors. True, but cashing out on visitors is a complicated process whereas customers are a direct source of money. Hence, content-based sites may be granted some clemency. A business, however, can’t afford to have a slow-loading site. Most business sites have numerous pages, e-commerce sites have dynamic effects along with multimedia elements and tons of images, which slow them down. Hence, for all sites out there that let users complete a checkout process while they are logged in, it’s imperative to improve the loading time. How this can be done is what we are going to discuss here shortly. A loading time drop of just 2.2% culminated in 10 million extra downloads. Firefox is not an e-commerce brand, and the activity performed in this example was download, not checkout (Although both checkout and download qualify as CTAs). 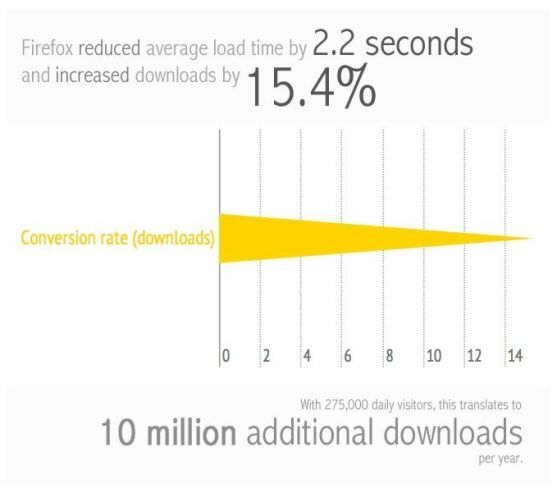 Since downloading firefox is free, 10 million downloads don’t look startling enough. Had it been an online store, the number would have been cut to half or may be just a quarter. Now one quarter of 10 million is 2.5 million. Imagine that many buyers are purchasing from the store. If I were the store owner, Id have filed for IPO after this (Pun intended). For B2C companies that depend on the internet to sell stuff, even an ounce of load time drop may result in the loss of millions in sales revenue. Loading time, as it seems, is just; it does both harm and good in equal measures, just as I said in the beginning that it can make or break a website. 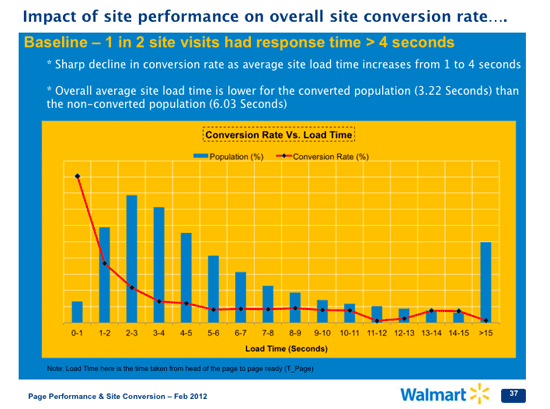 Brands have managed to quantify the loading time’s impact on conversion rate. This shows there’s more to the correlation between the two. For a converted shopper, the pages, especially the landing page, load two times faster than a shopper who is not converted. 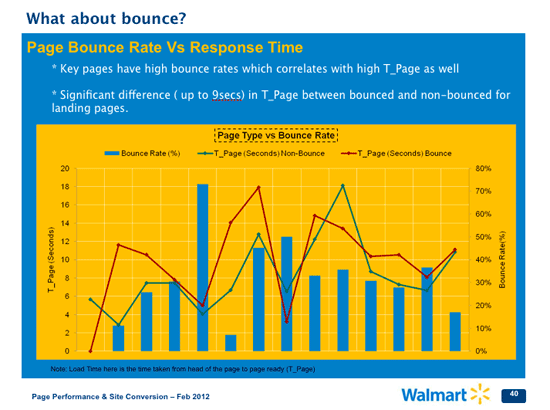 Landing pages that register high bounce rate load slowly than those that register low bounce rate. The gap between them is 9 seconds. As millions can go down to the drain because of a 1-second delay, a 9 seconds gap is huge. Note the above findings are from 2012. Four years ago shoppers had more patience and longer attention span. Those who access the internet from handheld devices strongly dislike slow-loading sites. Mobile users have everything but patience, because the handheld interface is more intuitive than standard desktop interface (Swiping up, down, right and left and tapping on icons, that’s all it takes), users want everything to load in seconds. When something takes time to load, they get pissed. The majority of mobile shoppers are millennials, and they value the experience besides the product. The scale at which mobile was used for e-commerce has increased rapidly, and now we have M-commerce or mobile commerce taking over the e-commerce segment. An e-commerce site that loads slowly pushes visitors to abandon the checkout process. Loading time is a pressing concern on the handheld platform because the checkout process is already plagued by several usability issues. The load time being slow adds to it and we have a huge number of mobile shoppers turning their back on the e-commerce brands. We’ve discussed how page load time affects conversion rate and how sales margin goes up and down depending on it. Image compression: The larger the image, the longer it takes to load. Webmasters know this and they scale down large images before uploading them on their sites. But that doesn’t solve the problem as the browser loads the images at their original size. Compressing images can help overcome this problem. As compressed images are optimally sized, the browser doesn’t exert to display the images, and the site loads fast. Use browser caching: This technique is for repeat visitors. As a brand, you’ll want a loyal customer-base. For that you need to have thousands of repeat visitors. The clever way to speed up the site when it is visited by those folks is to enable browser cache. What’s the point of doing that? Through browser caching, you can save data on the visitor’s computer when he visits the site next time. The storage is temporary, it’s benefit is visitors don’t have to wait for the entire site to load. The duration of the storage depends on two things; one is the configuration of the browser and the other is cache settings of the server. In case you need resources to leverage browser caching, here’s one. Follow the guidelines there and your site will load faster. App-only strategy: This strategy is for e-commerce sites or online stores. They don’t necessarily need websites. Many a times, they spend time and resources on bringing parity between the desktop and mobile versions of a site, which is completely a waste of time and resources. And despite doing that, the mobile version still suffers from usability problems. Getting rid of the website altogether may sound unfeasible to some, but they fail to convince me why a website is a must for an e-commerce or a social commerce brand. The product page is always at the bottom of the conversion funnel, driving traffic to the checkout page. For a desktop site, many don’t even visit the product page. But an app takes them straightway to the product page without any delay as HTML5 improves the loading time and most apps are powered by it. Cut back on redirects: Shopping sites sometimes instruct browsers to redirect users from one URL to another. They do that for a reason. 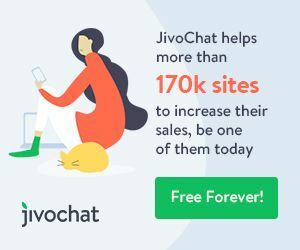 If the site is popular among the buyers, some may purchase similar domain names (Where users might land after mistakenly typing the URL), hoping visitors will land on those domains (And maybe click on some ads). The problem is redirects are a major cause behind delay in site loading. They not only make the loading speed more miserable than it already is, but also hurts SEO. That’s why Google has recommended webmasters to minimize redirects. As you follow the tips shared here to improve the loading time, your site’s conversion starts to jack up. Don’t forget to have the conversion measurement metrics at work because in their absence, gauging the increase or decrease in conversion rate will be incredibly difficult. Mike is a Digital Marketing professional and currently working as a PR manager at #TruConversion.com. He truly loves Online marketing and anything digital. He is very focused about who he works for. Once he starts work, he is fully committed to his duties and responsibilities at that company. Website Speed really a matter for any business, if you website loads with low speed then you will lose a lot of your business. Thanks for sharing those suggestions for page speed optimizations. It will encourage entrepreneurs to work more effectively on digital marketing and gain potential results from it. I would like to be here again to find another masterpiece article.